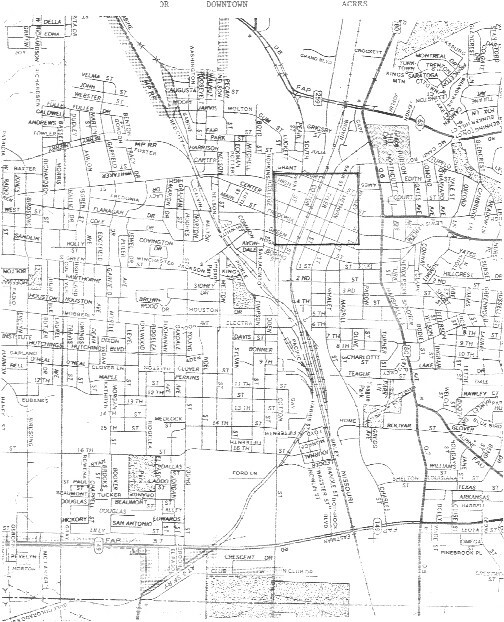 This map has the first 100 original acres of Longview marked off inside a square. It gives some prospective on how much the town has grown over the years. Longview came about by O.H. Methvin deeding 100 acres to the southern Pacific Railroad for $1 on April 7, 1870 and an adjacent 50 acres for $500 on October 28, 1870. The sale of the initial 100 acres is marked as the "birth of Longview". The following year, on January 27, 1871, the Longview Post Office was established. The city of Longview, on May 17, 1871, became the first incorpated town in the future Gregg County.